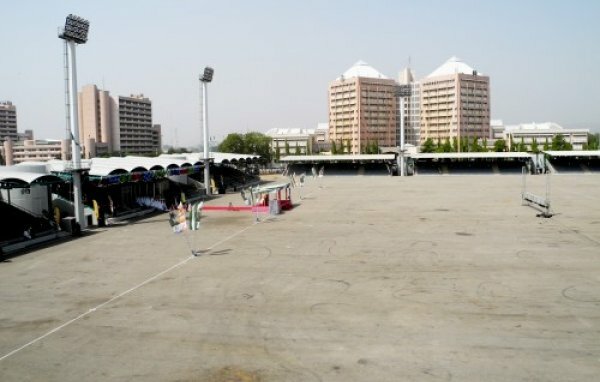 The Eagle Square, Abuja was constructed in 1999 to serve as the platform for the official take-off of the Fourth Republic of the Federation of Nigeria. It has since then provided the primary arena for the symbolic transfer of power and inauguration of the new Government, notably the Swearing-in Ceremony of the Executive President of the Federal Republic. The Eagle Square is used for hosting the National Day parade and the Presidential Swearing-in ceremony, as well as, in staging a number of political rallies/programmes, religious crusades/rallies, musical concerts/shows, launchings and award ceremonies. The Eagle Square is conveniently set within the precincts of the major landmarks of the FCT; it is flancked on both sides by the Federal Secretariat, while it faces the national Cenotaph, the National Assembly, and the Supreme Court. It has fabulous view of the Aso Rock Hills that serve as a back drop to the Presidential Villa while to its rear is a car parking lot capable of holding at least 500 vehicles.